We hate stray hairs left just as much as you do! So we always tweeze afterwards followed by a double and triple check to ensure they’re all gone. We’ll even try and remove as many of your ingrown hairs as possible and show you how to maintain them. Your comfort is important to us –we use the highest grade of hot wax on sensitive areas and cartridge rollers for your arms and legs. No intense exercise, avoid sweating – no sauna, spa, swimming. No direct sun after treatment and 48hrs after. Wear SPF. Not recommended to fake tan on the same area on the same day. Keep area clean and avoid touching. Exfoliate once or twice a week to avoid ingrown hairs. Moisturise daily to soften skin. Our staff are trained in Mens Waxing. Knowing how to manourve around beards, sensitive skin with thick hair all while keeping your service fast and effective is an art. 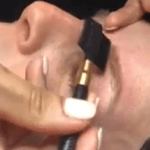 Keeping your eyebrows neat but NOT overly manicured is the reason why so many men trust our services. At Beautyologist we have packaged together some of our most popular waxing pairs and discounted the price saving you money.